Synthetic peptide corresponding to 15 amino acids near the N terminus of the human IRE1 protein. Our Abpromise guarantee covers the use of ab37117 in the following tested applications. WB Use a concentration of 0.5 - 2 µg/ml. 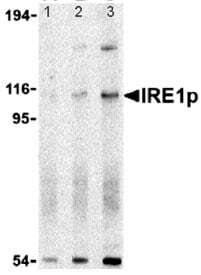 Detects a band of approximately 107 kDa (predicted molecular weight: 110 kDa).Can be blocked with Human IRE1 peptide (ab39786). Senses unfolded proteins in the lumen of the endoplasmic reticulum via its N-terminal domain which leads to enzyme auto-activation. The active endoribonuclease domain splices XBP1 mRNA to generate a new C-terminus, converting it into a potent unfolded-protein response transcriptional activator and triggering growth arrest and apoptosis. Additional bands at: 150 kDa, 55 kDa. We are unsure as to the identity of these extra bands. 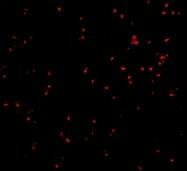 Immunofluorescence of IRE1p in A20 cells using ab37117 at 10 ug/ml. ab37117 has not yet been referenced specifically in any publications. Publishing research using ab37117? Please let us know so that we can cite the reference in this datasheet. There are currently no Customer reviews or Questions for ab37117.